Shady capitalists, corrupt politicians, and 12-foot lizards. They’re all out there, and they’re running our world. At least, that is the contention of many folks on the fringes of society (and, let’s be honest, quite a few not on the fringes too). Going back around 20 years, “humorous journalist” Jon Ronson spent several years tagging along with assorted extremists from a diverse range of backgrounds. What did they all have in common? A belief that our world was run by a hidden elite. Ronson – Jewish liberal and Guardian journalist – may seem an unlikely man to ingratiate himself with Islamic fundamentalists, Ku Klux Klansmen, and neo-Nazis, but as the misadventures detailed in Them (2001) show, being an extremist is no fun if there isn’t an audience. And so Jon finds himself infiltrating owl-burning ceremonies alongside some of the world’s most powerful men, driving Osama bin Laden’s “man in England”, and on the road with Ian Paisley in Africa. All in an attempt to uncover the New World Order, who, apparently, run this world from a secret room. Locating and exposing this secret room is a mighty ambition for a picaresque with some of society’s marginalised characters and Ronson chooses to focus his efforts on exposing the shady Bilderberg Group, which seems to be the only tangible lead he has to follow. 20 years on from the events in this book, and the Bilderberg Group – a secretive annual meeting of top politicians, business people, and interested parties – is probably more widely known due to the proliferation of the internet (the group is a well-discussed subject among conspiracy theorists in chat rooms). So much so, in fact, that it seems unlikely to be the all-powerful cabal of puppeteers who run the world. After all, wouldn’t a secret group with all the resources at their disposal be a bit more, you know, secret? What Bilderberg is, however, is a good story. 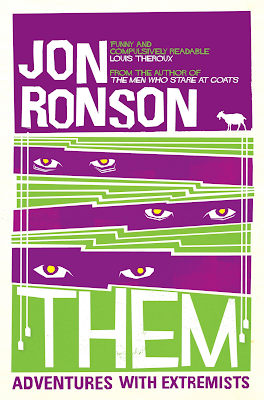 The further into the book one gets, the more apparent it becomes that all the disparate people Ronson talks to feel the need to live their lives in opposition to some shadowy “them” who stand between the ordinary man and a much better society. It is no great insight to say living in opposition is not confined to the extreme edges of society. When you break into the narrative of almost any group of people, you discover that the lines are all the same, it is just the focus that changes. Today’s Remainers lament incompetent government and the lies and lethargy that are carrying the UK out of Europe; Brexiteers despise the World Government the EU is becoming and the liberals too blinded by their Cause to see this. Domestic politics is dominated by discussions of how the working man is being screwed over by immigrants, Etonian MPs, economic naivety, or callous capitalism, depending on who you talk to. Atheists decry the pressure exerted on governments by religious institutions and the religious view themselves as ostracised by an increasingly secular world. Football fans wax lyrical about the governing bodies who corruptly favour the biggest teams, who have allowed the working man’s game to become overrun by foreign billionaires and pampered players – of course, each team’s supporters define themselves as better than their most bitter rivals based on their style of play / quality of fans / financial dealings / success / glorious failures / ethos / place in the community, etc. It seems we, whoever ‘we’ are, struggle to go about our personal existence without having a ‘them’ who somehow fail to see the world as we do, who are duped by the system and are sleepwalking into the apocalypse. One thing humans will never be short of is conspiracies. Don’t get me wrong, we cannot dismiss every act of opposition with one swipe. Ronson, with his Jewish background, is all too conscious that anti-semitism has often placed the Jewish people at the heart of conspiracy theories, stretching back to The Protocols of the Elders of Zion and beyond. As he meets one caricatured extremist after another, he is very clear to examine his own biases and also to listen with a fine ear for any codewords that might have replaced ‘Jew’ in the modern narrative of the New World Order (in his time with David Icke, Ronson reports the fallout from various groups decrying Icke as anti-semitic and of using ‘12-foot lizards’ as a codeword for ‘Jews’). The book isn’t weighed down with this self-awareness, however. If anything, it takes itself and its characters more lightly than you’d expect. Had it been published after 11 September 2001, I’m not sure Ronson would have been allowed to keep the tone quite as light but really, lightness is what is needed here. Ronson is great at puncturing the extreme views held by his subjects and of the media who demonise these extremists themselves. I particularly enjoyed the chapters with Omar Bakri Mohammed (a “semi-detached Ayatollah”), who seems to be the Del-boy of Islamic Fundamentalism in London. These chapters feel more like farce than anything but there is a more serious issue at play when Ronson examines the disparity between the media’s portrayal of these fringe members of society and their reality. The siege at Ruby Ridge in 1992, which saw two members of a family gunned down by US federal marshals, is a perfect example of what can happen if the rhetoric around groups who choose to live on the fringes of society is inflammatory. 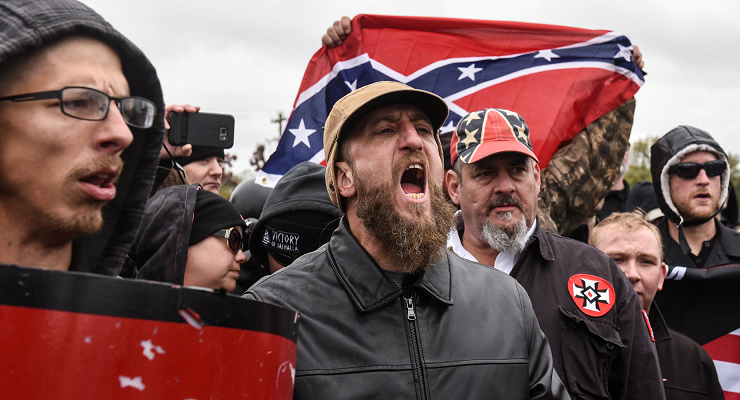 The Weaver family were seen as white supremacists (and all that goes with that label) by the mainstream and so when the state staked out their home in the hope of bringing Randy Weaver – the father – in on a firearms charge (or more specifically, failing to show at trial for said charge), using deadly force was, presumably, not seen as disproportionate. The incident is a founding moment in the American militia movement. My own ignorance doesn’t allow me to go into this in detail but suffice it to say that when it is considered acceptable for a (assumed law-abiding) mother and her son to be killed by federal snipers, the stories we tell (and their dehumanising effect) about groups in our society should be reviewed. Most people do not solely marginalise themselves. For all that, there is a dark mist hanging about many of the characters in this book. Regardless of how heavily Ronson editorialises and caricatures the people he spends time with, the truth is, death and disharmony surrounds them. While Them is an entertaining and, in some ways, enlightening book, it is hard to feel one is getting anything more than a flippant look at very real issues. There is a talent and a humanity in this approach to storytelling but there is something quite unsettling in it too.